I dont think we are seeing the death of the salesman, rather the defining of a role that has long brought value and stability to an industry. The marketplace is changing; PPACA has created a tidal wave of confusion and opportunity while carriers are side-stepping and pivoting to find their way through regulatory detours and roadblocks. In the middle of this changing landscape employers are paddling up stream, often with one oar, looking for resources and solutions to benefit issues for their employees while trying to read the tea leaves of change. For many employers they are finding less and less guidance from their previous advisors, many of who have moved on to other markets or products in an effort to make up lost commission due to the PPACA changes while dealing with a feeling that their contribution and value to the marketplace has either lost its luster or value, to the employer and to the carrier. I don’t think we are seeing the death of the salesman, rather the defining of a role that has long brought value and stability to an industry. Professional salespeople bring energy, creativity and drive to a marketplace. There is a shift in the marketplace from carriers providing classroom training for new recruits to what was previously referred to as out-source training. This is nothing really new in the industry; many carriers have fluctuated from having home office national in-house sales schools to mentor programs at the local level. They have provided various levels of management so sales people who help “field train” a new salespeople could receive some kind of override from the new business produced for a period of time to incentivize continued growth in the new recruit. These in-house, carrier trainings were primarily supported through “captive” shops so in their view they had a built in ROI to train. The recent changes in the marketplace, restrictions on loss-ratio to commission and renewal caps have created, in the mind of many in leadership at carriers, a dis-incentive to support sales training, opting instead to move to a “broker” model, recruiting “volume” of sales people, counting on getting a little business from a lot of salespeople where support is scaled back to on-line, administrative and web-based assistance. I’m not saying that this shift, which has been in the works for a number of years is necessarily bad, in fact it may be, to a certain degree, good business. What aren’t addressed by carriers, in my experience, are the skill level of the salespeople recruited and the lost ancillary benefit of having a salesforce who value the carrier relationship in proportion to the benefit of the “product”. What happens at a lot of carriers is they think from the inside out rather than from the outside in. The view is Broker Dealers and Agencies have their own sales training models and will provide sales training to new sales people they recruit so the carrier feels justified in providing webinar training, which for many of them they promote as “sales training” yet are really just product training…and there is a big difference. Here’s the thing, Broker Dealers and Agencies have seen a precipitous drop in either the volume of their business or a marketed reduction in their first year commission and/or renewal. To compensate for this evolving drain on their way of life they are both recruiting and engaging in more personal production. So what isn’t considered by carriers is the time and effort it takes for a BD or agency to either pull someone from production to train or tie yourself down with a new salesperson, reducing written business or creating a further reduction in commission to train someone who, in many cases, will not be around in six to twelve months. Moreover most managers train the way they sell rather that the way the salesperson “will” sell. That doesn’t make them a bad manager or less of a good salesperson rather sales training is an art, a particular skill that someone hones and crafts over a number of years successfully selling, training and retaining a sales distribution. The old adage is still true today, you train what you know but you reproduce “who” you are. 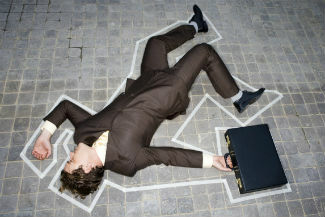 So I don’t think we are seeing the death of the salesperson but we are seeing a shift in the value of their services. This may mean a higher “churn” rate of those who come in the business and don’t make it to those who are successful, through determination and initiative yet may not see the value in taking the time to transfer those important skills. And what are those important skills that new sales people who succeed must master? A successful sales training course follows some time proven formulas, a proven one is that you train the salesperson on the things you want them to do the most, in the order you want them to do those things. Think of a typical sales call, how long does it take, an hour? And if you were going to tell the prospect about the benefits of your product how long would that take, 10 – 15 minutes or 10 – 15% of the sales time? Now when a new sales person is hired most organizations spend 80% of their time training them on the product, in other words 10 – 15% of the sales call, I’m not saying the product isn’t important, it is and effective product knowledge is critical. However, before you even know if the new salesperson is willing to do the things necessary to succeed many organizations is spending 80% of the training time to train on 15% of the sale. Yet their very success and that of the carrier, the Broker Dealer/Agency may very well depend on the new salespersons skill at the other 80% of the sales process! The point is if a new sales person isn’t willing to do the activity necessary to develop new prospects, doesn’t know how to approach, ask questions to qualify, etc. what value is the 80% of time spent on 10 – 15% of the sales time – product training?